This blog is based, with some modifications, on one published in March of 2018 as part of Women’s History Month and to announce the availability in the State Archives of the Lillian Exum Clement Stafford Papers (PC.2084). She remains worthy of additional highlighting as North Carolina begins a campaign to recognize women breaking barriers and to celebrate the upcoming 100th anniversary, 2020, of women’s suffrage. A member of the North Carolina Bar and a practicing attorney, L. Exum Clement (as she signed her official portrait) chose to run for the state legislature even before women gained the vote, through ratification of the 19th Amendment in August of 1919. This entry was posted in News and tagged women, Women's suffrage, Women’s History Month on March 22, 2019 by Ashley. Ella Currie McKay was born in 1888, the daughter of a progressive, North Carolina farmer with 75 acres of sandy, arable land in Robeson County. A highly resourceful man, her father managed to send four of his nine children—two girls and two boys—to college. Three of them became medical professionals—two doctors and one registered nurse. Ella was that nurse. At age twenty-four in 1911, Ella graduated from Philadelphus High School. At Red Springs, a mile away, she attended and graduated from Flora MacDonald College for women, and in time, Whitehead-Stokes Sanatorium Nursing School in Salisbury, North Carolina. 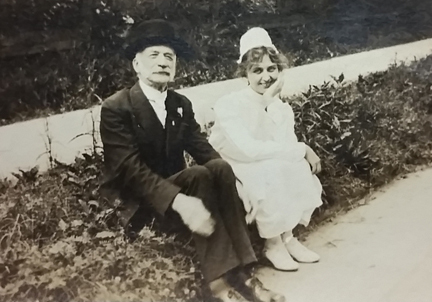 Her professional nursing career began in May of 1917 at the Confederate Soldiers Home in Raleigh. Her many letters to her family at this time reveal thoughts about her two brothers, doctors serving in the war, and about whether she should join in the fight. Just prior to the end of World War I, in September of 1918, Ella joined the U.S. Army as a Red Cross nurse. Her first posting was at the military hospital at Camp Meade, Maryland, nursing the wounded and afflicted soldiers. Within ten days she contracted Spanish Influenza. Too ill to work, she was kept isolated from her patients and others for weeks. Her eyes remained “glued shut,” she said, and her back ached as if it would break. But her symptoms were more merciful than those suffered by the soldiers she encountered once she again took up their care. She surely was now squarely on the front lines of the flu epidemic of 1918, estimated today to have killed more people worldwide in the short time it raged than all those who died in the four years of the First World War. This entry was posted in News, Special Collections and tagged Private Collections, Women’s History Month, World War I on March 30, 2017 by Ashley. It’s Women’s History month! 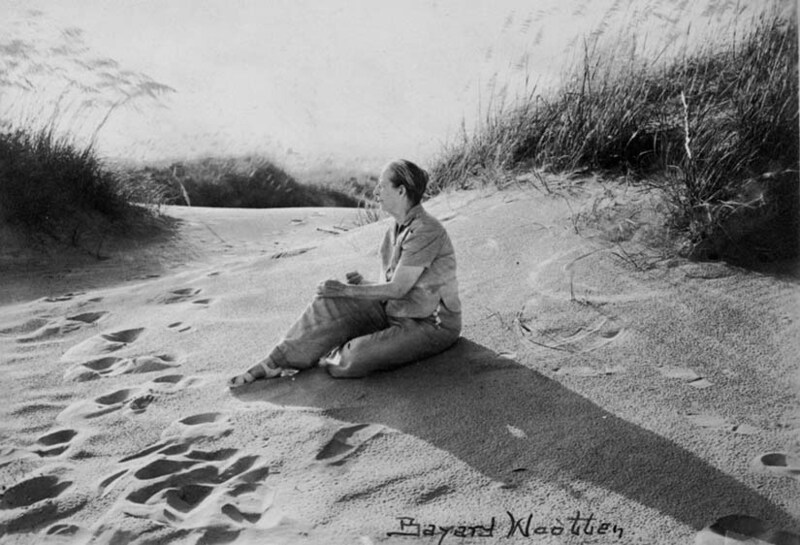 Today we highlight photographer Bayard Wootten. Bayard Wootten posing near sand dunes at Nags head, NC, Dare County, c.1920’s. Courtesy Ms Louise Morgan, Brevard, NC. (N_95_1_68) From the General Negatives, State Archives of NC. Mary Bayard Morgan Wootten (1875–1959) was an American photographer and pioneering suffragist born in New Bern, N.C. Also a competent painter, she is credited with designing the first trademarked logo for Pepsi-Cola. 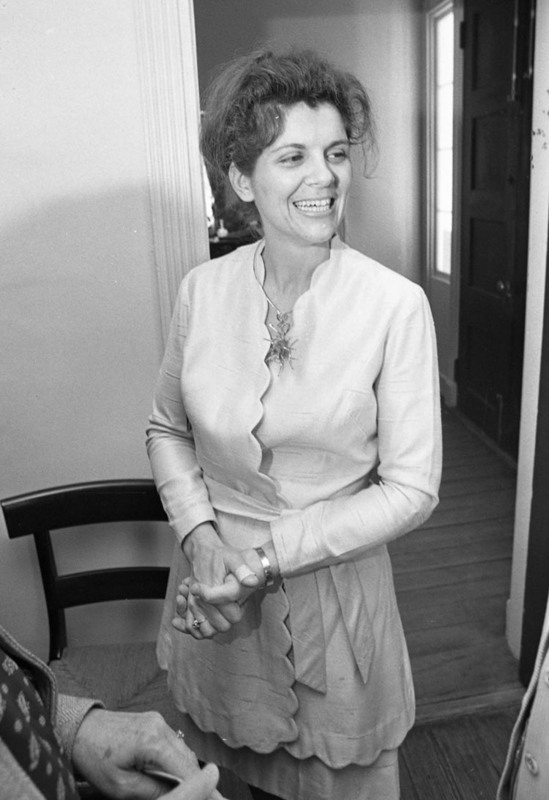 Wootten was adventurous and unflinching in all aspects of her life, especially business. She owned several photography studios and was known to set out on solo trips across the state in her 1920s Ford to photograph North Carolina’s people and landscapes. She continued to photograph well into her seventies and operated her photo studio until 1954. A trailblazer for women photographers in the South, Wootten overcame economic hardship, gender discrimination, and the obscurity of a small-town upbringing to become the state’s most significant early female photographer. She died in 1959 in Chapel Hill at the age of 83. Wootten was adventurous in finding new angles for images, once dangling off a cliff to take the perfect photograph of Linville Falls. In 1914 she became one of the first female photographers to engage in aerial photography when she flew in an open-air Wright Brothers Model B airplane and took pictures of the landscape below. She was also the first woman in the North Carolina National Guard. 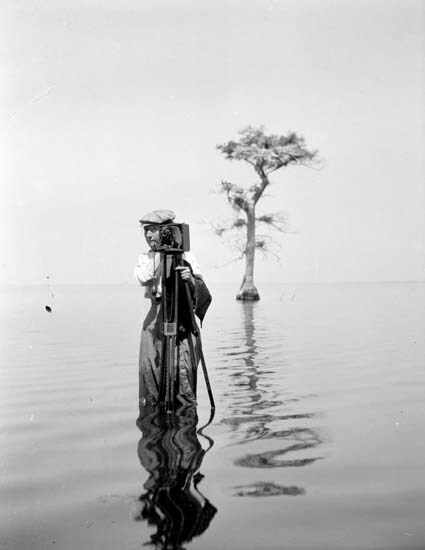 Photographer Bayard Wootten with camera in front of cypress tree in Great Lake, Craven County, NC, 1909. Photo by H. H. Brimley. (PhC42_Bx16_Great Lake_F1-2) From the H. H. Brimley Photo Collection, PhC.42, State Archives of NC. Originally trained as an artist, Wootten worked in photography’s pictorial tradition, emphasizing artistic effect in her images at a time when realistic and documentary photography increasingly dominated the medium. Traveling throughout North Carolina and surrounding states, she turned the artistry of her eye and lens on the people and places she encountered and is perhaps best known for her photographs of people living in impoverished rural areas in her home state of North Carolina. Many of her photographs were used as illustrations for six books, including Backwoods America by Charles Morrow Wilson, 1934; Cabins in the Laurel by Muriel Sheppard, 1935; Old Homes and Gardens of North Carolina by Archibald Henderson, 1939; and From My Highest Hill by Olive Tilford Dargan, 1941. UNC-Chapel Hill’s Wilson Library is home to the Bayard Morgan Wootten Photographic Collection which includes over 90,000 images and other materials created by Bayard Morgan Wootten and the Wootten-Moulton studios. Formats include glass negatives, film negatives, photographic prints, lantern slides, artwork, and some manuscript materials. The State Archives of North Carolina houses only a few copies of some pieces of her work, but is fortunate to have several original photographs of Wootten working with H. H. Brimley photographing in eastern North Carolina in the first decade of the 20th century. This entry was posted in Special Collections and tagged audio visual materials, Photographs, Women’s History Month on March 7, 2017 by Ashley.